My food writing class has wrapped up but that doesn’t mean I’ve stopped reading the great food memoirs, essays, and food blogs for the semester. I think it’s safe to say that I’m constantly doing these kinds of readings. My favourite food blogs are written by great writers and photographers alike, like Dinner with Julie, David Lebovitz, and Jen from use real butter. This is just the tip of the iceberg for my blog idols. Now that I’ve started to really hone my eye for food photography, I have realized that I need to step up my game for food writing. What the class has taught me is that there is more to food writing than writing recipes and reading food blogs. I’ve gotten a few more polished pieces for my portfolio of food writing, despite having over 200 blog posts here. Don’t get me wrong, althoughÂ I spend a lot of time writing and editing my posts, my blog posts are generally not quite as well articulated as say, my 20 page paper that’s due next week. But the things I took away most from the course is what you can do with food writing, be it a blog post, restaurant review, or a food memoir. You can educate with food writing. You can make people remember. Take people on a little tour through your childhood by connecting food to your memories.Â According to my blog survey, you guys seem to really like the anecdotes I share with my recipes. Sounds good to me. Food is great, but it can be boring. That’s where the stories come in, like how teenage Lisa and oatmeal led to a little bit of heartbreak. It’s funny to look back on my terrible old posts and see how far the writing and photography has come. There are a lot more personal details on my blog now than there were before. I’ve even talked about Chris a little. I’m feeling nostalgic for the simple days of making food and just taking a crappy photo to share for you guys. My blog traffic was maybe 25 people a day, and that was so exciting for me. Why would people be interested in reading what I say, or seeing the food I make? I’ve tried to think of what makes me unique, and what makes you want to come back for more. It’s like writing a cover letter for yourself. You need to pump yourself up despite the cultural norms of downplaying yourself so you don’t seem self-absorbed or vain. I’m still working on it. The photography’s getting better, and the writing is a long process of chipping away the extraneous opinions and voices that come out through my writing in order to have a clear and recognizable voice. Yikes this post took a turn from where I originally wanted to start it. How was that? Oh right, kale. For kale-haters who think that it’s too tough, bitter, and gross tasting for your liking, TRY MASSAGED KALE SALAD. 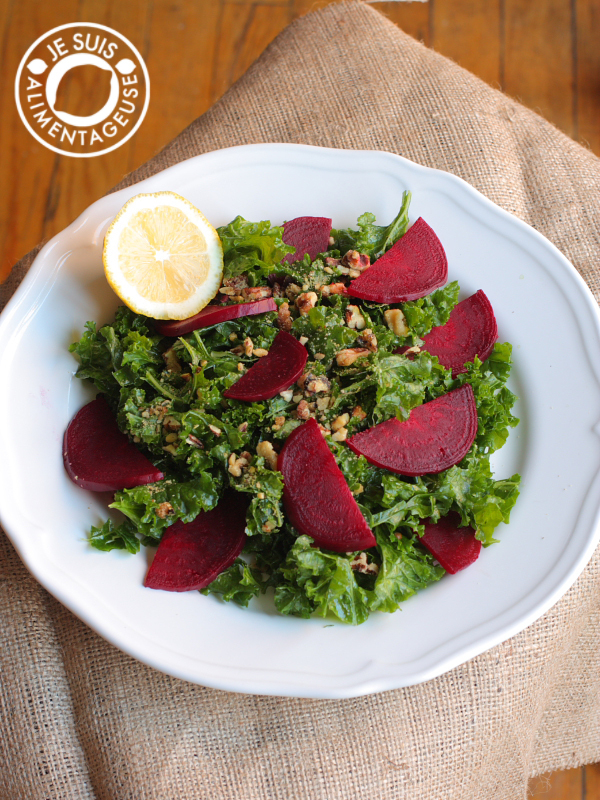 With some loving squeezes, a drizzle of olive oil, a spritz of lemon juice and a sprinkle of salt, you get this bright, supple, almost sweet salad with all the great qualities and nutrients of dark leafy greeks without the gross, masticating torture of eating dense kale. Plus, the olive oil is extra loving for your hands. My digits were smooth and soft after massaging these power greens. Try it. And let me know what you think! Optional: cooked beets, sliced apples, vegan walnut parmesan , seeds, nuts, dried cranberries (or raisins), but for a more savoury salad, you can add tempeh, coconut bacon, marinated tofu, shredded carrots...anything your tastebuds desire. 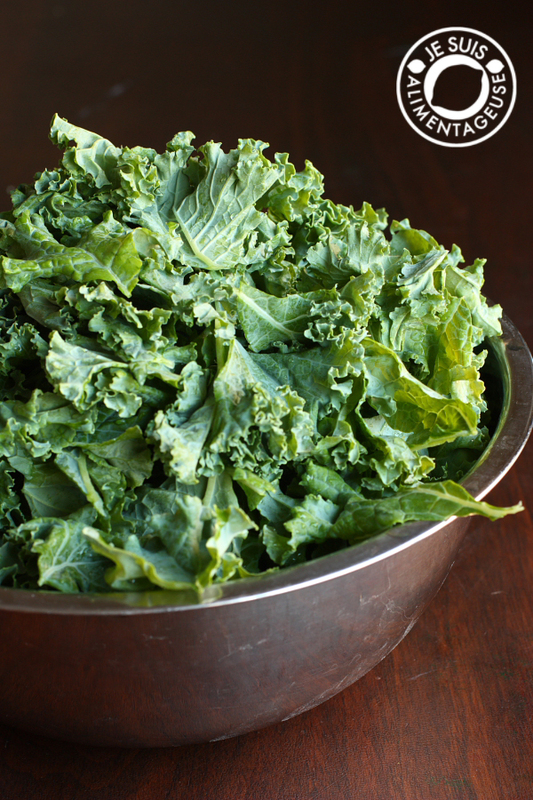 Run your washed and torn kale through the salad spinner until dry. Pour off excess water and transfer to a large bowl. Drizzle olive oil on top. With clean hands, massage the kale by squeezing and gently twisting until the kale "wilts" down and turns into a bright green. It'll start to look sweaty and it'll lose its bitter bite. Top with salt, lemon juice, and give another good squeeze. Add whatever other salad toppings you'd like. Enjoy!